limited to 500 copies, hand numbered. Although Burzum have not released a black metal full-length for several years, Varg?s unwavering influence on the scene is still felt as much today, if not more so today than ever before, as it was when he himself was releasing the music under the Burzum banner, which spread itself across the Scandinavian skyline for all to memorise and eventually respect every day since his departure and eventual return to the scene which adores him. 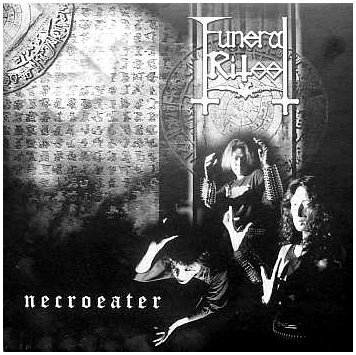 Funeral Rites, an obscure band from Japan, are a different breed of Burzum inspired black metal. As the description of the bands genre might tell you, they play a hybrid style of black and death metal, though the latter comes in more subtle forms, allowing the black influences to reign supreme for the most part. Given that Funeral Rites allow some outside influence into their music, they do not come across as a standard clone band, especially when one takes aspects like the vocals into consideration as they deviate far from the traditions of Varg?s shrieks. Funeral Rites also use two vocalists, one as a backing vocalist to the leading vocalist and this also draws out a different sound to what Burzum deduced many years prior to this record. Songs like the beautiful ?Lost Misery? are a good indication of how unusual Funeral Rites are in comparison to the majority of Burzum inspired bands these days. The band use a keyboard section to increase the sensitivity in the song, and in the record, heightening the sense of melancholy which runs through the blood of this inspired outfit. The keyboards add a unique flavour to a sound which has long since been considered dead. Funeral Rites use the hypnotic black metal style to their advantage, creating several fantastic leading riffs and despite the repetitious stance of the songs, there is enough creativity to stop this from becoming stale, or tedious. The vocals are also an area which makes that music sound far more original than the majority of bands doing a similar thing. A lot of the work, including instrumental play, reminds of what ?Hvis Lyset Tar Oss? would sound like if it were crossed with Darkthrone?s ?A Blaze In The Northern Sky?, with its hollowed out guitar tones and driving bass.